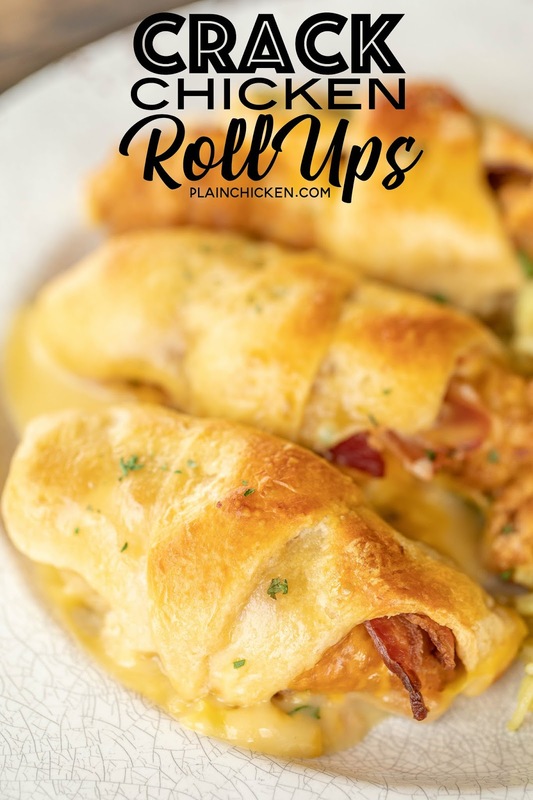 These Crack Chicken Roll Ups are one of our favorite weeknight meals. This casserole is so easy to make and it tastes fantastic!!! 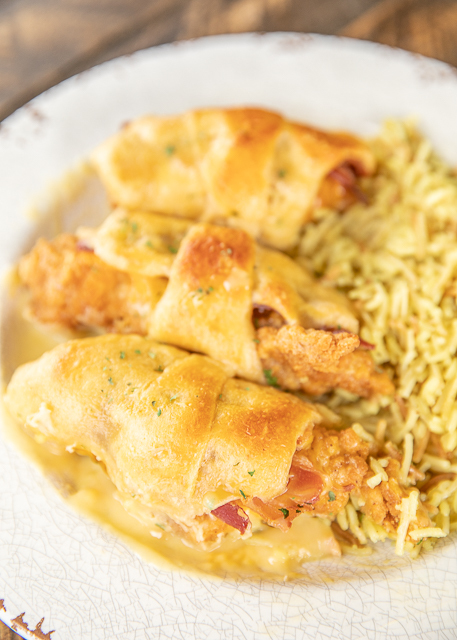 Frozen chicken fingers, cheddar cheese, bacon and ranch wrapped in crescent rolls topped with a yummy sauce. My favorite!! 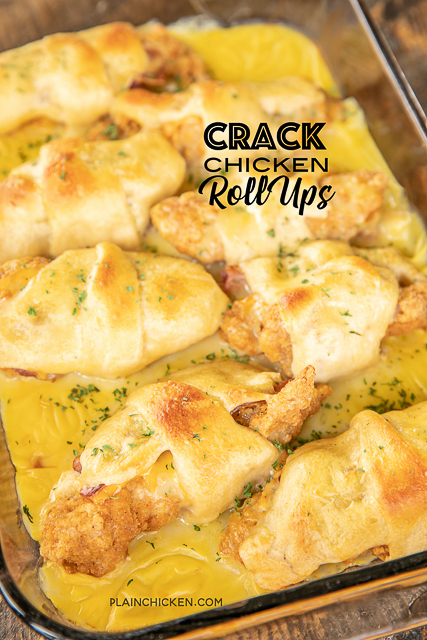 I used frozen chicken fingers in this Crack Chicken Roll Ups recipe. There is no need to thaw the chicken before assembling and baking. The chicken will cook while the casserole bakes. Talk about easy dinner prep!! 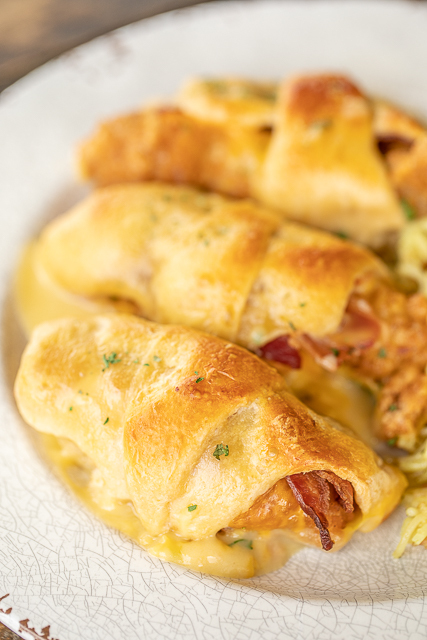 We served these Crack Chicken Roll Ups with some Roasted Green Beans and Homemade Chicken Rice-A-Roni. This is seriously one of our favorite meals. It is so quick and easy to make and it tastes great!! Preheat oven to 375ºF. Lightly spray a 9x13-inch baking dish with cooking spray. Set aside. Separate crescent rolls into 8 triangles. Spread 1 teaspoon of ranch dressing on top of each roll. 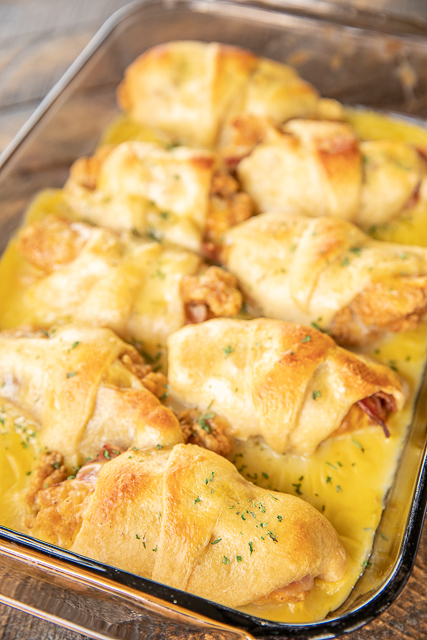 On wide end of crescent roll, place 1/2 slice cheddar cheese, 1 slice bacon and 1 chicken tender. Roll up and place in prepared baking dish. Whisk together cream of chicken soup and milk. Pour over crescent rolls. could a person prep this before the time and refrigerate/freeze? I haven’t tried making this in advance. As always, please use your best judgment regarding substitutions and modifications. Yum! I actually started following you a million years ago (or that's what it feels like in Internet time) with your crack dip! Love this as a dinner option! Thanks, Steph! Does the chicken tender have to be frozen? Is the chicken dry at all? What kind of chicken tenders did you use? Doesn't pouring the soup over the crescent rolls make them soggy??? I assume the chicken fingers are precooked frozen ones? Can you use raw chicken tenders instead of the frozen breaded ones? Do you need to precook the bacon? ahhhh, I misread the directions! thought it said one tablespoon haha. thank you!! Happy Thanksgiving! Hard to roll up the crescent roll with a frozen chicken tender. What am I doing wrong? ?